^ Sun; Donahue; Voit (2007年). “H-alpha tail, intracluster HII regions and star-formation: ESO137-001 in Abell 3627”. arXiv:0706.1220 [astro-ph]. ^ Fraser Cain (20 September 2007). “Galaxy Leaves New Stars Behind in its Death Plunge”. Universe Today. http://www.universetoday.com/2007/09/20/galaxy-leaves-news-stars-behind-in-its-death-plunge/. ^ Smith, Robert T. (1941). “The Radial Velocity of a Peculiar Nebula”. Publications of the Astronomical Society of the Pacific 53: 187. Bibcode: 1941PASP...53..187S. doi:10.1086/125301. ^ Burbidge, E. Margaret (1964). “The Strange Extragalactic Systems: Mayall's Object and IC 883”. Astrophysical Journal 140: 1617. Bibcode: 1964ApJ...140.1617B. doi:10.1086/148070. ^ Baade, W.; Minkowski, R. (1954). “On the Indentification of Radio Sources”. Astrophysical Journal 119: 215. Bibcode: 1954ApJ...119..215B. doi:10.1086/145813. ^ S. J. O'Meara (1998). The Messier Objects. Cambridge University Press. ISBN 0-521-55332-6. ^ Inglis, Mike. Galaxies. pp. 157-189. doi:10.1007/978-1-84628-736-7_4. ^ Burbidge, G. (1999). “Baade & Minkowski's Identification of Radio Sources”. Astrophysical Journal 525: 569. Bibcode: 1999ApJ...525C.569B. ^ Brunthaler, A.; et al. (2000). Astronomy & Astrophysics Letters 357: 45. arXiv:astro-ph/0004256. Bibcode: 2000A&A...357L..45B. ^ SEDS, Lord Rosse's drawings of M51, his "Question Mark" "Spiral Nebula"
^ Romani; David Sowards-Emmerd; Lincoln Greenhill; Peter Michelson (2004). “Q0906+6930: The Highest-Redshift Blazar”. The Astrophysical Journal 610: L9-L11. arXiv:astro-ph/0406252. Bibcode: 2004ApJ...610L...9R. doi:10.1086/423201. ^ Rodriguez Zaurin, J.; Tadhunter, C. N.; Gonzalez Delgado, R. M. (2008). “Optical spectroscopy of Arp220: the star formation history of the closest ULIRG”. Monthly Notices of the Royal Astronomical Society 384 (3): 875. arXiv:0711.0166. Bibcode: 2008MNRAS.384..875R. doi:10.1111/j.1365-2966.2007.12658.x. ^ Murray, Steven (1999). “ACIS Imaging of the Starburst Galaxy M82”. Chandra Proposal ID #01700041: 362. Bibcode: 1999cxo..prop..362M. ^ Grebel (2000). “Star Clusters in Local Group Galaxies”. , "Massive Stellar Clusters", ASP Conf. Ser. Vol. , eds. A. Lancon & C. Boily (Provo:ASP) 2000 (211): 262-269. arXiv:astro-ph/9912529. Bibcode: 2000ASPC..211..262G. ^ a b c Lehnert, M. D.; Nesvadba, N. P. H.; Cuby, J.-G.; Swinbank, A. M.; Morris, S.; Clement, B.; Evans, C. J.; Bremer, M. N. et al. (2010). “Spectroscopic confirmation of a galaxy at redshift z = 8.6”. Nature 467 (7318): 940-942. arXiv:1010.4312. Bibcode: 2010Natur.467..940L. doi:10.1038/nature09462. PMID 20962840. ^ Capak, Peter; Carilli, C. L.; Lee, N.; Aldcroft, T.; Aussel, H.; Schinnerer, E.; Wilson, G. W.; Yun, M. S. et al. (2008). “Spectroscopic Confirmation of an Extreme Starburst at Redshift 4.547”. The Astrophysical Journal 681 (2): L53-L56. arXiv:0806.0657. Bibcode: 2008ApJ...681L..53C. doi:10.1086/590555. ^ a b Yoshi Taniguchi (2008). “Star Forming Galaxies at z > 5”. Proceedings of the International Astronomical Union 3. arXiv:0804.0644. doi:10.1017/S1743921308020796. ^ Kodaira; Taniguchi; Kashikawa; Kaifu; Ando; Karoji (2003年). “The Discovery of Two Lyman-α Emitters Beyond Redshift 6 in the Subaru Deep Field”. arXiv:astro-ph/0301096 [astro-ph]. ^ Hu, E. M.; Cowie, L. L.; McMahon, R. G.; Capak, P.; Iwamuro, F.; Kneib, J.-P.; Maihara, T.; Motohara, K. (2002). “A Redshift [CLC][ITAL]z[/ITAL][/CLC]?=-6.56 Galaxy behind the Cluster Abell 370”. The Astrophysical Journal 568 (2): L75-L79. arXiv:astro-ph/0203091. Bibcode: 2002ApJ...568L..75H. doi:10.1086/340424. ^ Hu, Esther M.; McMahon, Richard G.; Cowie, Lennox L. (1999). “An Extremely Luminous Galaxy at [CLC][ITAL]z[/ITAL][/CLC] = 5.74”. The Astrophysical Journal 522: L9-L12. arXiv:astro-ph/9907079. Bibcode: 1999ApJ...522L...9H. doi:10.1086/312205. ^ a b Arjun Dey; Hyron Spinrad; Daniel Stern; Graham; Chaffee (1998年). “A Galaxy at z=5.34”. arXiv:astro-ph/9803137 [astro-ph]. ^ Franx, Marijn; Illingworth, Garth D.; Kelson, Daniel D.; Van Dokkum, Pieter G.; Tran, Kim-Vy (1997). “A Pair of Lensed Galaxies at [CLC][ITAL]z[/ITAL][/CLC] = 4.92 in the Field of CL 1358+62”. The Astrophysical Journal 486 (2): L75-L78. arXiv:astro-ph/9704090. Bibcode: 1997ApJ...486L..75F. doi:10.1086/310844. ^ Wil van Breugel; Carlos De Breuck; Adam Stanford; Huub Rottgering; George Miley; Daniel Stern; Dante Minniti; Chris Carilli (1999年). “Ultra-Steep Spectrum Radio Galaxies at Hy Redshifts”. arXiv:astro-ph/9910311 [astro-ph]. ^ a b Hyron Spinrad; Arjun Dey; Graham (1995). “Keck Observations of the Most Distant Galaxy: 8C1435+63 at z=4.25”. The Astrophysical Journal 438: L51. arXiv:astro-ph/9411007. Bibcode: 1995ApJ...438L..51S. doi:10.1086/187713. ^ Miley, G. K.; Chambers, K. C.; van Breugel, W. J. M.; Macchetto, F. (1992). “Hubble Space Telescope imaging of distant galaxies - 4C 41.17 at Z = 3.8”. Astrophysical Journal 401: L69. Bibcode: 1992ApJ...401L..69M. doi:10.1086/186673. ^ a b Chambers, K. C.; Miley, G. K.; van Breugel, W. J. M. (1990). “4C 41.17 - A radio galaxy at a redshift of 3.8”. Astrophysical Journal 363: 21. Bibcode: 1990ApJ...363...21C. doi:10.1086/169316. ^ Paola Mazzei; Gianfranco De Zotti (1995年). “Dust in High Redshift Radio Galaxies and the Early Evolution of Spheroidal Galaxies”. arXiv:astro-ph/9509108 [astro-ph]. ^ Le Fevre, O.; Hammer, F.; Nottale, L.; Mazure, A.; Christian, C. (1988). “Peculiar morphology of the high-redshift radio galaxies 3C 13 and 3C 256 in subarcsecond seeing”. Astrophysical Journal 324: L1. Bibcode: 1988ApJ...324L...1L. doi:10.1086/185078. ^ a b Lilly, S. J.; Longair, M. S. (1984). “Stellar populations in distant radio galaxies”. Royal Astronomical Society 211: 833. Bibcode: 1984MNRAS.211..833L. ^ Longair, M. S. (1984). “The Most Distant Galaxies”. Journal of the British Astronomical Association 94: 97. Bibcode: 1984JBAA...94...97L. ^ Smith, H. E.; Junkkarinen, V. T.; Spinrad, H.; Grueff, G.; Vigotti, M. (1979). “Spectrophotometry of three high-redshift radio galaxies - 3C 6.1, 3C 265, and 3C 352”. The Astrophysical Journal 231: 307. Bibcode: 1979ApJ...231..307S. doi:10.1086/157194. ^ McCarthy, P J (1993). “High Redshift Radio Galaxies”. Annual Review of Astronomy and Astrophysics 31: 639-688. Bibcode: 1993ARA&A..31..639M. doi:10.1146/annurev.aa.31.090193.003231. ^ a b c Sandage, Allan (1961). “The Ability of the 200-INCH Telescope to Discriminate Between Selected World Models”. Astrophysical Journal 133: 355. Bibcode: 1961ApJ...133..355S. doi:10.1086/147041. 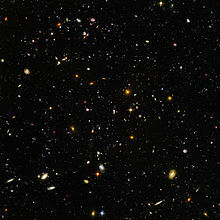 ^ Hubble, E. P. (1953). “The law of red shifts (George Darwin Lecture)”. Monthly Notices of the Royal Astronomical Society 113: 658. Bibcode: 1953MNRAS.113..658H. ^ Humason, M. L.; Mayall, N. U.; Sandage, A. R. (1956). “Redshifts and magnitudes of extragalactic nebulae”. Astron. J. 61: 97. Bibcode: 1956AJ.....61...97H. doi:10.1086/107297. ^ a b c “1053 May 8 meeting of the Royal Astronomical Society”. The Observatory 73: 97. (1953). Bibcode: 1953Obs....73...97..
^ Merrill, Paul W. (1958). “From Atoms to Galaxies”. Astronomical Society of the Pacific Leaflets 7: 393. Bibcode: 1958ASPL....7..393M. ^ a b Humason, M. L. (1936). “The Apparent Radial Velocities of 100 Extra-Galactic Nebulae”. Astrophysical Journal 83: 10. Bibcode: 1936ApJ....83...10H. doi:10.1086/143696. ^ a b Chant, C. A. (1932). “Notes and Queries (Doings at Mount Wilson-Ritchey's Photographic Telescope-Infra-red Photographic Plates)”. Journal of the Royal Astronomical Society of Canada 26: 180. Bibcode: 1932JRASC..26..180C. ^ Humason, Milton L. (1931). “Apparent Velocity-Shifts in the Spectra of Faint Nebulae”. Astrophysical Journal 74: 35. Bibcode: 1931ApJ....74...35H. doi:10.1086/143287. ^ Hubble, Edwin; Humason, Milton L. (1931). “The Velocity-Distance Relation among Extra-Galactic Nebulae”. Astrophysical Journal 74: 43. Bibcode: 1931ApJ....74...43H. doi:10.1086/143323. ^ a b Humason, M. L. (1931). “The Large Apparent Velocities of Extra-Galactic Nebulae”. Astronomical Society of the Pacific Leaflets 1: 149. Bibcode: 1931ASPL....1..149H. ^ Humason, M. L. (1930). “The Rayton short-focus spectrographic objective”. Astrophys. J. 71: 351. Bibcode: 1930ApJ....71..351H. doi:10.1086/143255. ^ a b c d Trimble, Virginia (1996). “H_0: The Incredible Shrinking Constant, 1925-1975”. Publications of the Astronomical Society of the Pacific 108: 1073. Bibcode: 1996PASP..108.1073T. doi:10.1086/133837. ^ “The Berkeley Meeting of the Astronomical Society of the Pacific, June 20-21, 1929”. Publications of the Astronomical Society of the Pacific 41: 244. (1929). Bibcode: 1929PASP...41..244.. doi:10.1086/123945. ^ Bailey, S. I. (1920). “Comet Skjellerup”. Harvard College Observatory Bulletin No. 739 739: 1. Bibcode: 1920BHarO.739....1B. ^ Hsiao-Wen Chen; Lanzetta; Sebastian Pascarelle; Noriaki Yahata (2000年). “The Unusual Spectral Energy Distribution of a Galaxy Previously Reported to be at Redshift 6.68”. arXiv:astro-ph/0011558 [astro-ph]. ^ Hu; McMahon (1996). “Detection of Lyman-alpha Emitting Galaxies at Redshift z=4.55”. Nature 382 (6588): 231-233. arXiv:astro-ph/9606135. Bibcode: 1996Natur.382..231H. doi:10.1038/382231a0. ^ Wampler, E. J.; et al. (1996). Astronomy & Astrophysics 316: 33. arXiv:astro-ph/9512084. Bibcode: 1996A&A...316...33W. ^ Elston, Richard; Bechtold, Jill; Hill, Gary J.; Ge, Jian (1996). “A Redshift 4.38 MG II Absorber toward BR 1202-0725”. Astrophysical Journal Letters v.456 456: L13. Bibcode: 1996ApJ...456L..13E. doi:10.1086/309853. ^ Smail, I.; Ellis, R. S.; Aragon-Salamanca, A.; Soucail, G.; Mellier, Y.; Giraud, E. (1993). “The Nature of Star Formation in Lensed Galaxies at High Redshift”. R.a.s. Monthly Notices V.263 263: 628. Bibcode: 1993MNRAS.263..628S. ^ Djorgovski, S.; Strauss, Michael A.; Spinrad, Hyron; McCarthy, Patrick; Perley, R. A. (1987). “A galaxy at a redshift of 3.215 - Further studies of the PKS 1614+051 system”. Astronomical Journal (ISSN 0004-6256) 93: 1318. Bibcode: 1987AJ.....93.1318D. doi:10.1086/114414. ^ NED, Searching NED for object "3C 123"
^ Spinrad, H. (1975). “3C 123: a distant first-ranked cluster galaxy at z = 0.637”. Astrophys. J. 199: L3. Bibcode: 1975ApJ...199L...3S. doi:10.1086/181835. ^ Cooke, Jeff; Barton, Elizabeth J.; Bullock, James S.; Stewart, Kyle R.; Wolfe, Arthur M. (2008). “A Candidate Brightest Protocluster Galaxy atz= 3.03”. The Astrophysical Journal 681 (2): L57-L60. arXiv:0803.3808. Bibcode: 2008ApJ...681L..57C. doi:10.1086/590406.